Last Saturday, just a few days after writing a post on my other blog about the sad fact that I rarely have reason to put my hair back in a ponytail anymore, I went to our organic produce market, as I do most weeks. On a whim, I bought an enormous amount of gorgeous local blueberries. 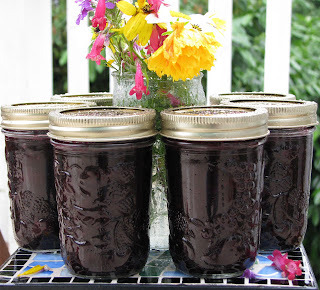 When I got home, I put my hair back, dug the canning equipment out from the shed, got rid of all the dead spiders, washed off the five-inch layer of dust, and made blueberry apple jam. I’d forgotten how much I love this: filling up the huge canning pot, chopping the fruit, watching the honey stream out of the measuring cup, taking the jars out of the boiling bath and setting them on towels, hearing them seal with a satisfying ping. All week long the jars have sat on my counter—it’s been raining and there hasn’t been enough natural light in the house to take pictures without the flash—and I keep picking them up, admiring their color. I finally gave up on waiting for a brighter day. Embracing the weather, I rolled up my jeans and went outside barefoot—it is summer, after all—and took pictures with this poor sodden bouquet, which has been sitting in the rain all week. I have to say that taking clear photos while squatting and holding an umbrella in one hand (to protect the camera, not me—I was already soaked) was not so easy. It’s a sign of how strange my kids know me to be that when I said to Child One, “I’m going outside to take pictures of jam in the rain,” he said, “Okay” without batting an eye. Just another one of those things Mom does. Simple pleasures like this used to be part of just about every day for me. The smell of fabric under a hot iron, pausing in my knitting to look at the rows of even stitches, writing a letter to a friend (by hand! ), eating cookies still warm from the oven, or kneading bread dough and feeling a connection to the millions of women who have spent countless hours doing the same thing—these things might seem boring to some, but they grounded me, slowed me down, and quieted my monkey mind. My goal is that by the end of my Year of Living Differently, I will have once again built room in my everyday life for these simple pleasures. And I SO want to try some of your jam. It sounds wonderful. Can you believe I have never made jam? And really, why should I when I have friends who do? I don't imagine you could mail me any, eh? Alright. Enough questions. Sorry about the rain. I was up at the fair, walking through the exhibition halls and looking at all the jams, and I don't think I saw any of them with this combination of fruits. Oh yeah, cool picture too. Wouldn't that color be beautiful on a wooden chair or a dresser? And wouldn't that jam look really good on my morning toast? It's yummy. The recipe was actually for a conserve, not a jam, with nuts and raisins, but the family vetoed that. 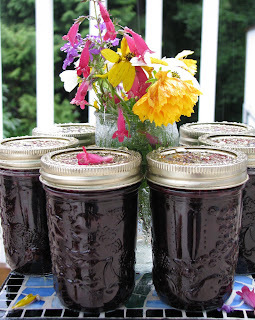 (Did you know that jelly, jam, preserve, conserve, and fruit butter all have their own definitions? Neither did I). So I just did the fruit, lemon juice, and honey (making it officially a jam) and it turned out great. I'd send you some if I thought it would get through the mail safely!